Go to the Apple II+. Click here for Apple IIc items available on eBay. I got to play a number of my old games from my II+ on this, since they're binary compatible, and I also already had a game or two which required 80 columns of text that I couldn't play on the II+, only the //c or //e. 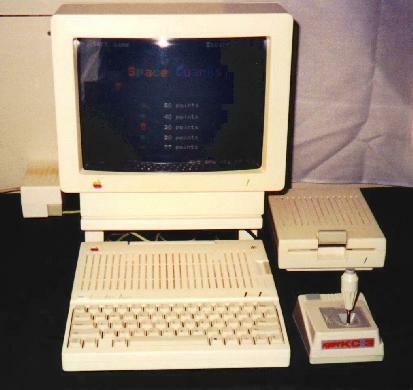 When I got this machine, it came with an Apple ColorMonitor instead of the usual tiny Apple "green screen" I had seen with it so often, a Kraft KC3 3 button with trim - analog "precision" joystick, a Laser 128 1 button mouse, and an Apple ImageWriter II color printer. It's sad to see how much technology has driven down the price of older hardware such as this. For example, I picked up an external floppy drive (as shown in the picture) from an Austin, Texas Goodwill Computer Works for $2.95 in early 2000! Print Shop - I don't think there was a single Apple II owner that had a printer that was without this! Where in the U.S.A. is Carmen Sandiego - A popular game in which you use clues to find Carmen. Beagle Write - (Formerly MultiScribe) - A word processor. Techno Cop - A fun game in which you drive to locations and catch the bad guys.